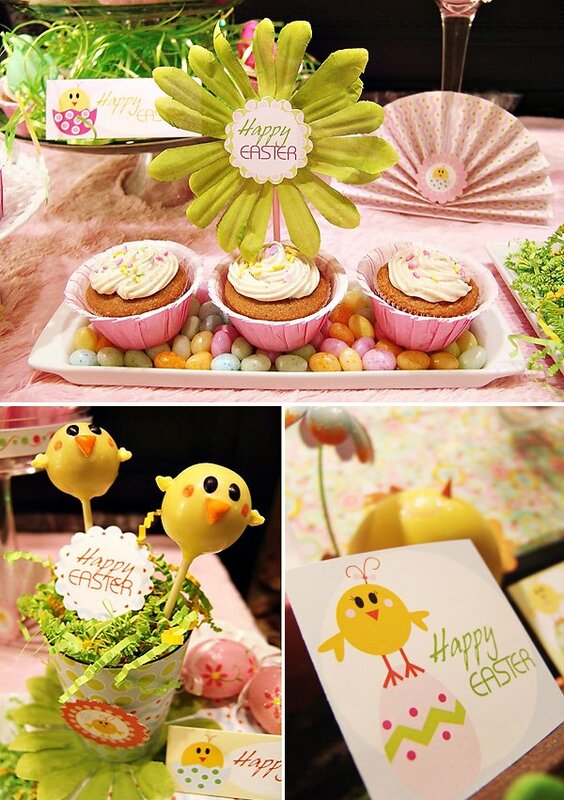 If you’re looking for some last minute Easter inspiration or just want to check out some festive eye candy to help get you in the holiday mood… this adorable Little Chick theme from Laura at Eye Candy Event Details if full of fun, budget-friendly ideas… like clever flower cupcake toppers and darling chick cake pops that would make Bakerella proud! 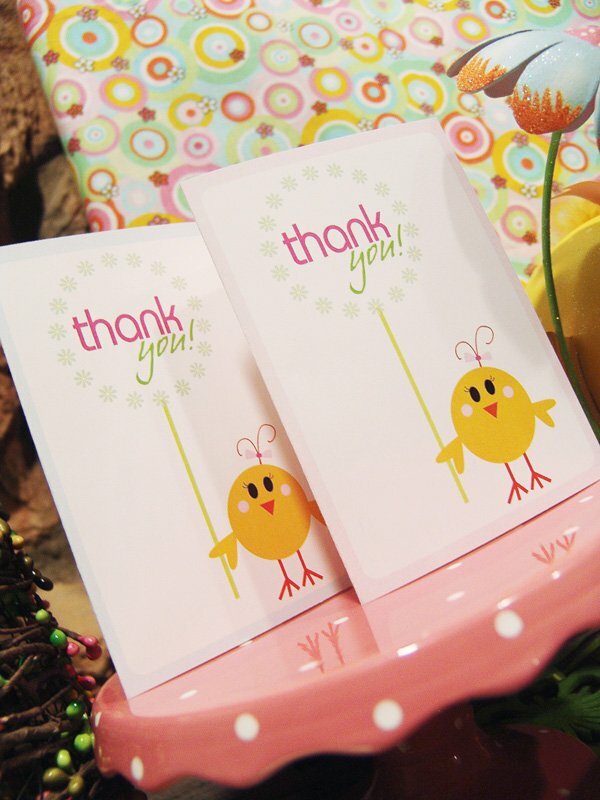 The super cute and modern chick graphic used throughout the party printables would actually translate beautifully to a “Little Chick” themed baby shower or first birthday party too! 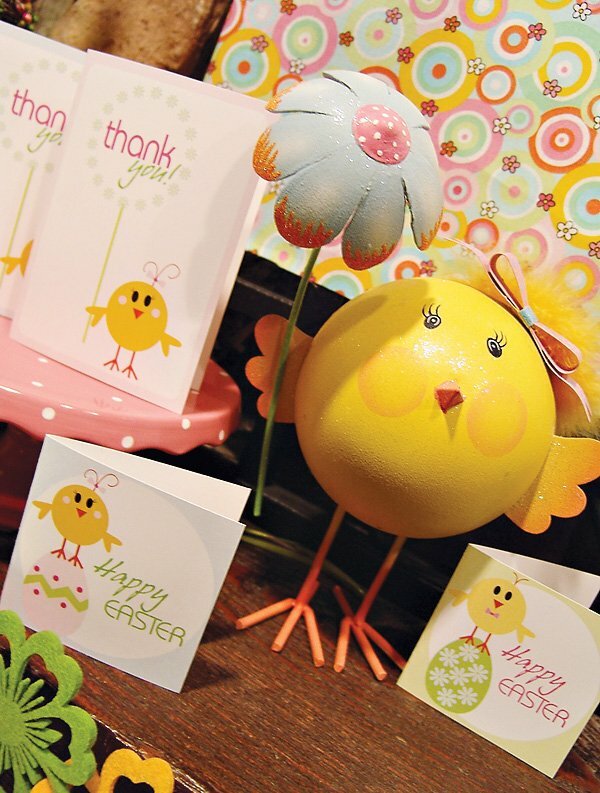 “I created the “Little Chick” Easter printable collection as a fun, whimsical way to celebrate the holiday for all ages. I had found a chick holding a flower at Pier 1 & she was the complete inspiration for the line! 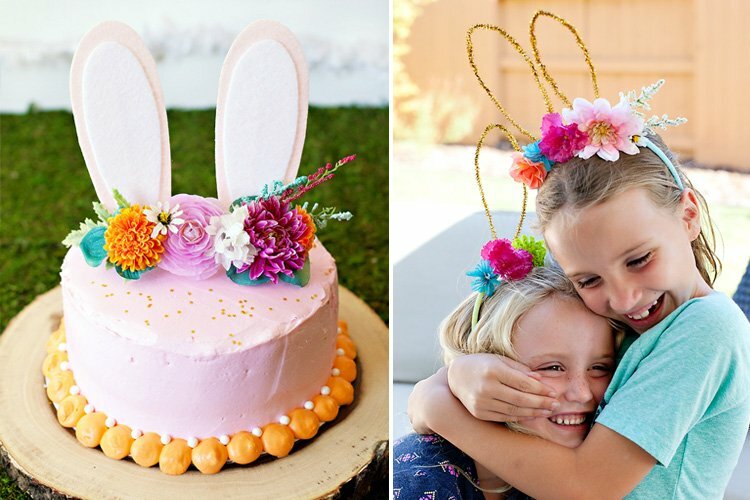 I am all about the details & sharing how to “DIY” most of a party. I always try to show my customers how they can throw a great party & not break the bank. 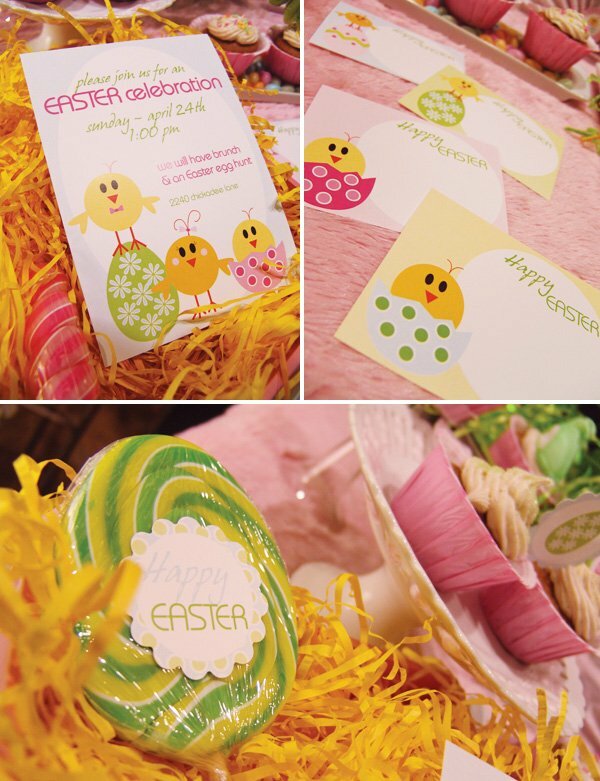 The collection includes items that can be multi-purpose: toppers, mini gift cards, favor topper bags, labels, favors, banner, thank you cards, napkin wraps, 12 designs paper pack & Easter sign all of which you will see different ways to use these items. I baked the cupcakes & dressed them up with toppers for a quick fun way to display on the dessert table. The only things I knew I wanted to have custom made was some cake pops & sugar cookies in order to really bring my little chick character to life in the best possible way. 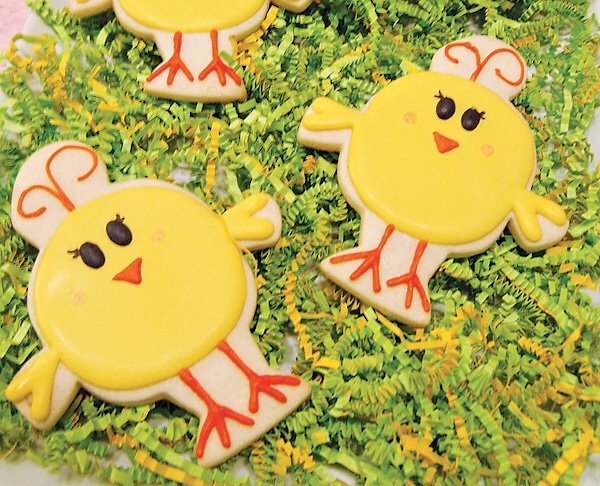 And what better way to add some FUN than to turn to my sweet friends – Nikki at The Sweetest Thing to design a cookie based on the little chick & Terri at Terri’s Party Treaures for the custom design of the cake pops. I gave them the artwork & they turned out awesome! I couldn’t have been more thrilled with the results! I chose my fireplace mantel as the main place to display everything. 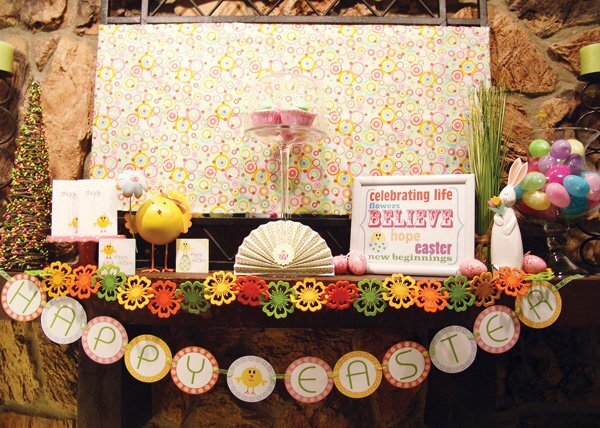 I wanted to incorporate some items on my mantel with Easter décor I already owned, such as the little chick from Pier 1 & some of the printable collection. Utilizing items from around my house is always my 1st “DIY” tip. 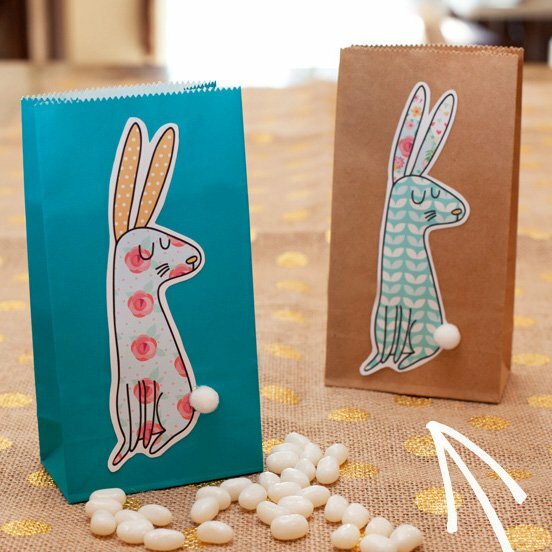 I used a huge glass container to add plastic Easter eggs (that my daughter will NOT let me get rid of) for a pop of color & an inexpensive way to dress up the area. 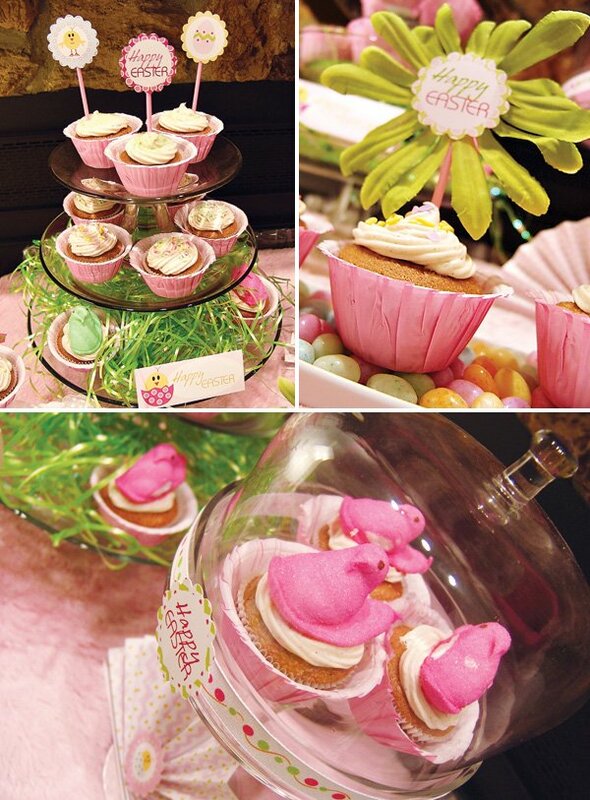 For the “centerpiece” of the mantle, I topped some cupcakes with Peeps and displayed them in a dome cake stand that I received as a gift recently. I also covered the huge mirror that hangs above the mantle with some fabric I got from Hobby Lobby awhile ago to give everything a colorful backdrop. On the dessert table underneath the mantle, I actually used my daughter’s pink blanket as a “tablecloth” to add some “fur” texture to the display! 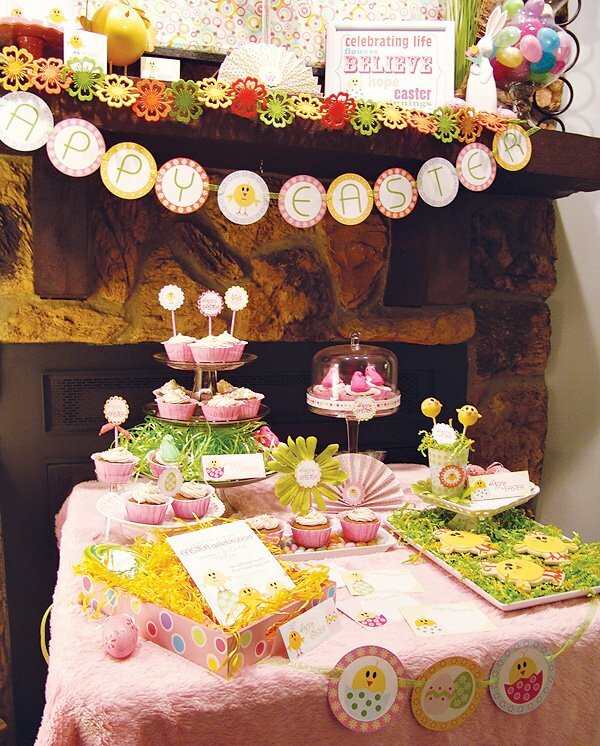 My “DIY” tips to create a quick & easy dessert table are: if you want a tall display – stack a couple cake stands to hold some cupcakes, put some toppers in the center, and add some Easter grass for texture to make a colorful cupcake arrangement. 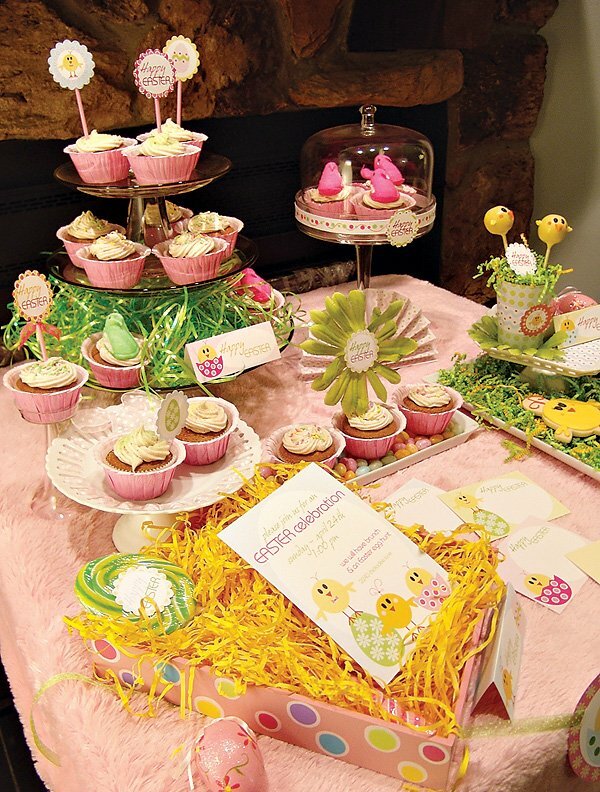 Add some Easter candy or Peeps to the top of cupcakes as an alternative topper idea. If you have a small white platter, you can create something quick & cute like this: I added some pastel jelly beans to the platter, then placed 3 cupcakes on top of them. For the cupcake in the middle, I used part of a faux flower as the main part of the topper, then glued a circle topper to the center for a fun, springtime look. I love shopping at Target’s dollar section! That’s where I found the adorable pink dotted serving tray that I used to display the invitation. It could also be used for a fantastic little tray for serving food or drinks, and the color scheme is one that can used at b-day parties & other themed events. For the cake pop display, I used my small white pedestal from The Christmas Tree Shop. The actual container holding the chick cake pops is just a plastic cup wrapped with printed paper + one of the napkin wraps & and a circle topper. I put some rocks in it to hold the cake pops in place & covered the rocks with paper shred. Quick & easy & affordable! When creating a printable collection, I like to include enough printed paper designs so people can do lots of “DIY” with the collection so they don’t have to spend a lot on a party besides the cost of the printables & a few other little touches. Love this! 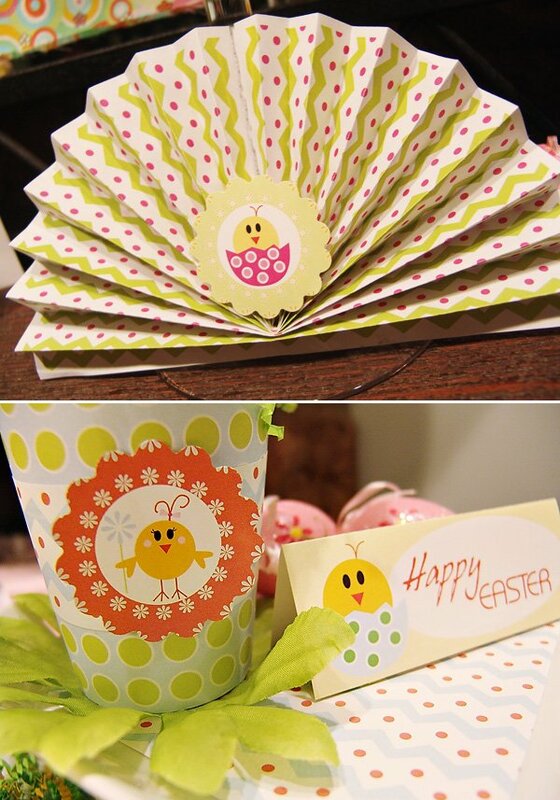 The little chick graphics are way too cute. 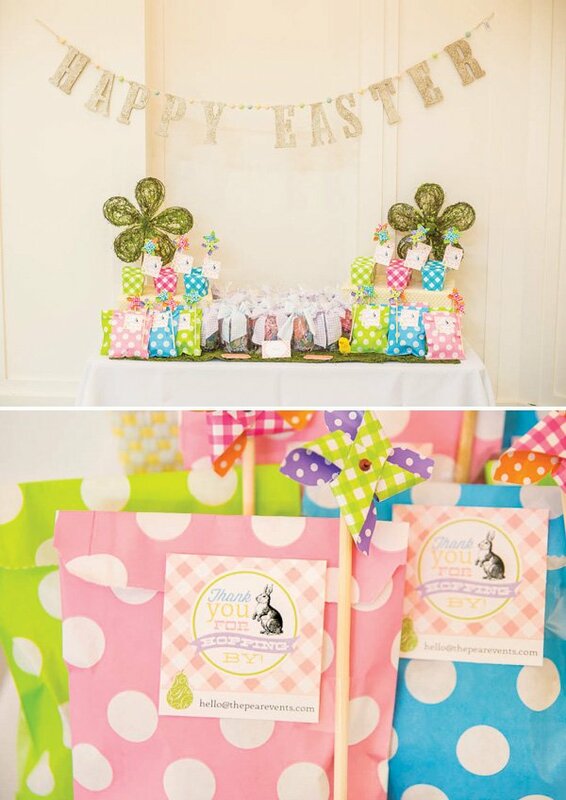 Might have to adapt this for a baby shower I’m hosting this summer! 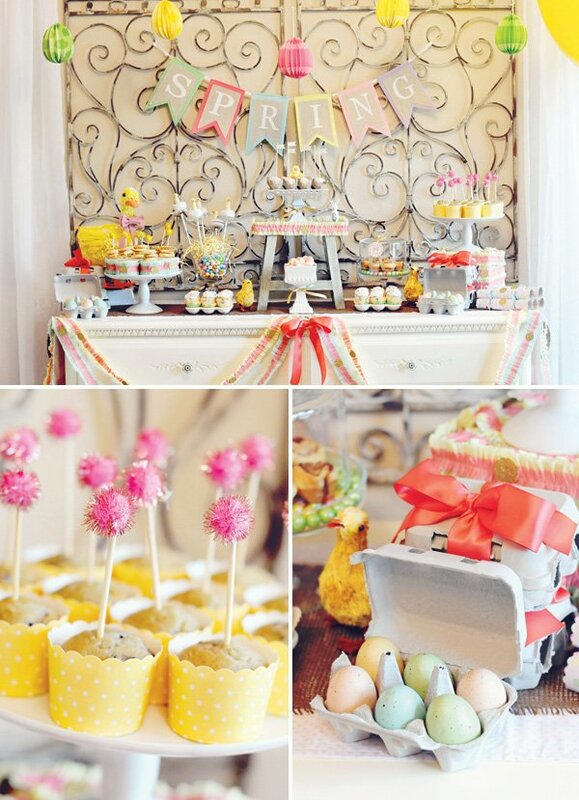 What a DARLING tablescape – I especially love the Happy Easter garland and the cupcake toppers! SO cute! thanks kelly! Make sure to become a fan of my FB page as I DO have plans to feature my “little chicks” into a baby shower theme as well as a birthday party. I will have them in my Etsy shop! Very, very cute Laura! Congrats! 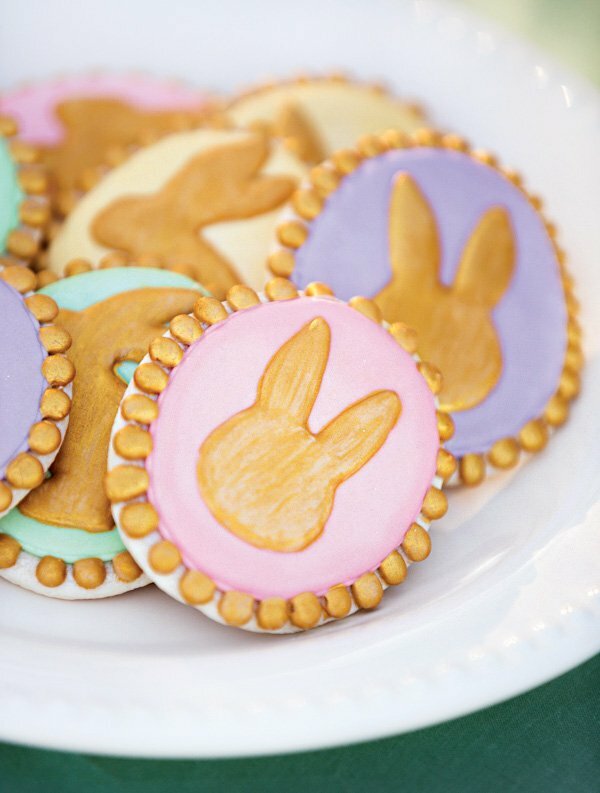 Oh my goodness, those chick cookies are ADORABLE! This is an adorable theme. With a few changes it would make a great baby shower theme. I like the simplicity & colors.